Duane Thomas was a man of few words after the Cowboys won Super Bowl VI. A lot has been made this week about Seahawks running back Marshawn Lynch giving the media the proverbial silent treatment, but perhaps no player has ever had less to say about the Super Bowl than Duane Thomas. 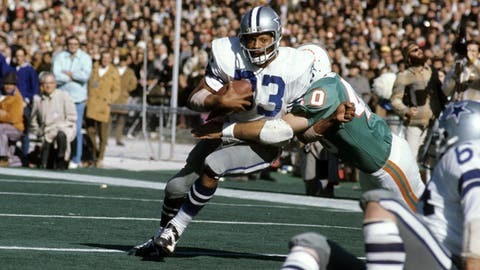 Thomas spent two years with the Dallas Cowboys in the early 1970s, and led the NFL in rushing touchdowns in 1971, with 11. He ran for 95 yards and a score in the Cowboys’ 24-3 win over the Dolphins in Super Bowl VI, and after the game he gave a one-of-a-kind interview to legendary NFL broadcaster Tom Brookshier. During Brookshier’s next question to Thomas — an odd one about whether he likes football, to which Thomas said, “Yeah, I do” — Brown, sensing the awkwardness, leaned in and asked if Brookshier was nervous. He said he was, but you might be, too, if that’s how your first question panned out.